Just like in a painting, there are certain pivotal moments in life when a myriad of puzzle pieces fall into place and a brand new picture begins to emerge. Let me start by saying I was raised by two YMCA directors who consistently showed me that community connection and giving back were fundamental parts of everyday life. So when I started my own business, it only felt natural for me to seek creative ways to “spread the love” by curating art fundraisers, offering scholarships, sharing online revenue, and generally staying in the current of giving and receiving wherever I could. But lately, I’ve been craving new ways to connect the overflow of creative abundance with communities that might truly benefit, and this felt especially important as I planned my Art of Aliveness Retreat in Bali. My friend, Rebekah Uccellini, has a special knack for connecting humans and building bridges in sensitive and meaningful ways. And that’s exactly what she did in Bali. When Rebekah met Sari, the visionary behind KIM Women’s Center (aka Sari Hati), she asked how our group might be of the most service. Sari shared that the women here had been cast-out of their community for not being able to have children, for leaving marriages, for being openly gay, or for having children with special needs, and what they really needed most was to feel seen, heard and connected with other women around the world who are just like them. As Rebekah walked around the center, Sari showed her the different job training areas: a store featuring the women’s handcrafts, a new beauty salon, a bamboo bike shop, the butterfly gardens, and a nursery. Then Sari mentioned that they always wished they had signs displayed to mark these areas, and to have on the road so people could find them easily. This was the perfect match for our group of inspired artists! After a truly life-giving week, our group was itching to paint more and to connect more deeply to the local community. This was the perfect opportunity to do both. On January 25th, our group of twenty women climbed into a bus and made our way past green rice fields and bustling villages to KIM Women’s Center. We were greeted with open hearts and warm smiles as we gathered around Sari and listened to her heartbreaking life story which served as inspiration to create this safe haven for Balinese women and children. We toured the community which Sari and these incredible women had slowly transformed from an old trash dump to a gorgeous food-forest covered with ever-expanding gardens, job training areas, playgrounds and community gathering spots- where ALL are welcome. The KIM Center motto is: Everybody is a teacher, every place is a school and every moment is a lesson. What happened next is something I’ll never forget. After hearing more about KIM and the women’s stories, our group shared the Brave Intuitive Painting process, and collaboratively, we created over twenty beautiful signs together. The kids were especially enthralled by this free way of painting, and as you might imagine, so many touching moments of connection transpired over stories, food, art, gardening, and simply being together. For me, the day felt like a huge breakthrough. 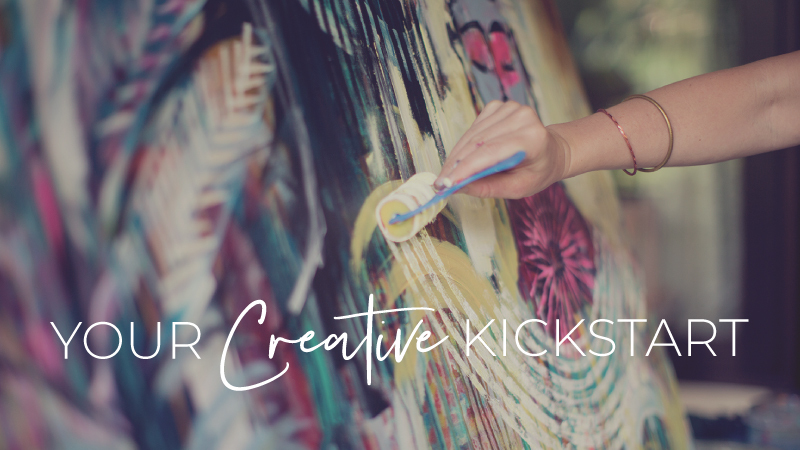 It showed me a way I could redirect the abundance of inspiration and love that’s cultivated during my creative retreats into communities that might truly benefit from our overflow of color, freedom, love, and heartfelt presence. I can’t even describe how deeply moving it was to build this bridge into the community. It felt like a long time coming, and many women in our group said it was the highlight of the whole retreat for them. As I dream into future Art of Aliveness Retreats, I feel absolutely certain that community art collaborations will continue to be a part of the experience. It feels like the missing piece I’ve been searching for! Needless to say, I’m feeling very inspiring! Thank you for being a part of this creative web of giving and receiving. I couldn’t do it without you. If you’d like to support Sari and the KIM Center, please use this paypal address: pkpubud@gmail.com. You can see where your money will go by reading the sign I painted below! You can also follow Sari and the Kim community on Instagram and Facebook, or email them directly at: kimwomenscentre@gmail.com.